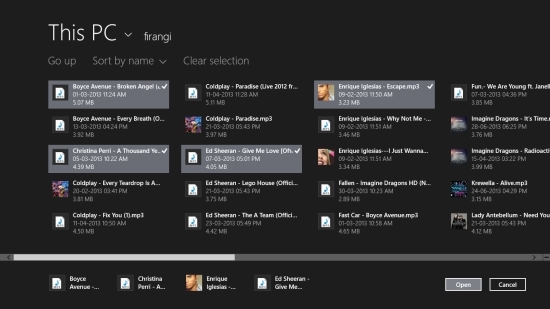 GS Player is a free Windows 8 Media Player that lets you play audio and video files on your Windows 8 system. Using this simple Media Player, you can listen to your favourite songs and watch videos you like. The app supports mp3 and wma file formats for audio and wmv, mp4, and avi file formats for video. This free Windows 8 Media Player has been designed with simplicity to facilitate easy access by everyone. Equipped with all the necessary functional keys, this media player is very easy to operate. You can browse and select multiple songs to create your playlists and listen to your favourite songs. The media player also enables you to enjoy videos on full screen mode. GS Player is freely available in Music & Video category of Windows Store. You can view the app directly in Windows Store by clicking on the link given below at the end. 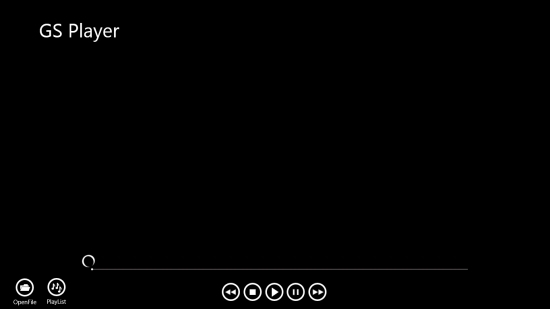 Let’s have a detailed look at this free Windows 8 Media Player. The main screen of the app displays all the functional keys including Play, Pause, Stop, Forward, and Rewind. You will also find options Open File and Playlist on the main screen. Click on Open File option to browse and select a video file of the specified formats. The video will play on the app’s screen. To enable Full Screen mode, click on Full Screen button placed on the bottom right corner of the screen. The Playlist option on the main screen of the app lets you select multiple songs from your local library and play them in the app. Similar apps: Media Player, Dual Player. GS Player is a simple Media player that supports selected audio and video file formats. It is simple and easy to operate. Therefore, anybody can use it very conveniently. Try it out and enjoy your favourite songs and videos. Share your feedback via comments.